Martyrdom of Guru Teg Bahadur, Guru Arjun, Younger sons of Guru, Hakikat Rai cannot become the model for children -Board outlook. Condition of teaching of Punjabi and teaching through Punjabi remains worse. Text Book Panels -Only Marxist and anti-Punjabi scholars appointed. Articles for text books : only marxist and so called progressive authors preferred. Naive and unmindful Akalis pursue the fraud education policy of Congress. Sometimes back boarded Shan-e- Punjab train from Delhi. Sitting just next to me was a Punjabi immigrant family from Barmingham (U.K). A Rly Police constable was constantly harassing them as they were carrying a giant sized bottle of whisky. They were clueless as to what should they do as the constable was repeating his command, "You can't carry it." I suggested them that they should better tackle the sepoy instead of feeling harassed. They promptly poured a peg and offered to him which he refused with a broad smile on his face. A lady sitting near me suggested that they offered him a Rupee 10 note. The NRl was prompt to take out a Rupees 20 note and slipped it into his hands of the soldier and he went away. The NRls hurled a volley of comments on corruption in India. Anyway with this episode the Singh's family became friend with me and through out the train joumev to Jalandhar we talked a lot about the two systems Indian and British. While in between when the husband and wife discussed domestic matters, their daughter aged about ten years, kept me informed of her school system and the games she played and TV channels she watched. This daughter of the Clean shaven Sikh took everybody in Punjab as a Sikh and then I explained her that there were Hindus and Muslims in India. I then assked her what she learnt about the Sikhs and happily she counted the names of all the ten gurus. She then starting reading (orally) the Japuji of Guru Nanak and an my query whether she knew as to what were the meaning of gurubani she was reciting. To my surprise she was correct in describing the meaning of Ek Onkar and Saibhang. She informed me that her teacher in the elementary school has taught it all. On the other hand my mother had always blamed us that we haven't taught anything about the religion to our children. With the train episode I was now armed with a clue that it was the duty of the schools to teach children as to who was Bhagwan Ram, Krishan, Guru Nanak, Guru Gobind Singh and why Guru's two infant sons were martyred. I obviously became curious why my own children have not learnt it all ? On my query my wards straightaway denied that it was not in their books. I saw their current year books. Really the things of this sort were not in their books. I saw one more year just to draw a blank and felt, oh lord me a journalist where haven't I gone to gather stories for my papers, I felt the stories were right near my typing table and I have been roaming in the far flung places. lmmediatly Giani Bhagat Singh the die hard Akali was before my eyes-Gianiji a lieutenant of Master Tara Singh, blamed Congress for any ill thing in the society. Once he narrated an incidence involving Sardar Patel, which we did not believe then. Gianlji said once Udham Singh Nagoke had gone to Sardar Patel the Home Minister of the independent India. Some how their talk was focussed on the Muslims that were left in India. The Nagoke who was then carrying venom for the Muslims for the incidences In Punjab complained why the Indian Govt. had still retained the seeds of future communal wars. Patel tried to pacify Udham Singh, "No Sardar sahib the Muslims in India will not remain Jinnah's Muslims". Continued he, " ln just 30 years you will find that they will read . Ramayana and Mahabharata". Udham Singh got alarmed and embarrassed the Gujrati Sardar, "Patel sahib! may I know what period have you fixed for the Sikhs to recite Gita and the Gayatri mantras'? "No, no Sardar sahib, we can't suspect the Sikhs they are our brethren, our saviours". ln any case Nagoke was alarmed and he told it all to Master Tara Singh in Gianiji's presence. He would blame that the Congress was bent upon in promoting communism in the Punjab. Once the Sikhs get converted to communism their future generations would automatically lapse in the ocean of Hinduism which is an ill defined 'religion where an agnostic can also be a Hindu, (Sankhyaki Purana is out and out atheistic; Vam margis are also Hindus). Though we did not agree to all what Gianiji said how ever we appreciated him on his comments on the dynamism of Hinduism. Any way the train incidence motivated us to explore what our children were being taught. We accordingly carried out a survey of the text books prescribed by the Punjab School Education Board (P.S.E.B. )to be startled with the result of the survey. While the survey of the entire syllabus was simply not possible secondly there was no point in carrying out the survey of such books as on Mathematics, Science, etc. We have therefore restricted our study to the subjects of Social Studies (of which History is a part) and the Punjabi language. Results of our survey have really surprised us. Though would have been better if the survey had covered such subjects as English and Hindi also. Our survey reveals the study of Punjab history is simply out of bounds to the students in Punjab. He is deprived of the knowledge on Sikhism and its rich and glorious past. Now while a student in Maharashtra has to study as to who was Shiva ji Marhatta and the Peshwas who succeeded him, the Punjabi student is not taught enough about the life full of sacrifices of Guru Gobind Singh. The syllabi can devote more than 100 pages on the role of freedom fighters who freed India from the yoke of the British but it does not devote more than 2-3 pages on the equally brave people of Punjab who freed Punjab from the tyranny of the later Mughals. Not even a single independent chapter on the Banda Bahadur and the Misals is given who saw that the mighty Sirhind was at the feet of the peasants and depressed people of the Punjab. Surprisingly it has devoted very little space in the text books to the glorious Sikh rule of the last century and how it was annexed thus doing great injustice to the history. The syllabi no doubt makes a mention of the incidence that the Sikh states did not participate in the Indian Mutiny of 1857 but it hesitates to mention the reason behind. ln their history chapter on the "Rise of New Forces in North India" how ever they take a peripheral round of the Sikh period. It is a universally acknowledged principle that a child learns more through demonstrations and models but the Board here fails to appreciate this principle as for as the examples from the Punjab history are concerned. The Text books make no mention of the supreme sacrifice of Hakikat Rai of 18th century and similarly fails to highlight the case of martyrdom of the young sons of Guru Gobind Singh who were aged merely less than 7 and less than 9 Years respectively. Though in the Punjabi book at places casual and accidental references do occur without mentioning their names. They are the best model for any school studies. The Board only considers teaching about freedom struggle leaders' sacrifices like that of Bhagat Singh and Lala Lajpat Rai. The syllabi makes no mention of the Vedas which were composed on this great land. lt fails to take notice how a great religion-Sikhism was born here and what are the principles of this religion and how the religion condemns caste system etc. Neither have they devoted any space for the Mahabharata, Ramayana and Puranic tales. ln Punjab where Per capita consumption of liquor narcotics and other intoxicating drugs is many times more than Indian average a full chapter was deserved any where in the Punjabi language book. The Board has completely ignored this aspect too. gaen Ure Freedom Strggte Par[ ttre Board has ignored other heroes of Punjab,similarlly fotk heroes are also omitted we don't find any essay sort of articles on Puran Bhagat, Tota Maina or other of the innumerable legends. We did not come across mere mention of name of such scholars like Bhai Kahan Singh Nabha, Dr. Ganda Singh, Hari Ram Gupta, KaviSantokh Singh, Bhai Veer Singh and other scholars of the category. Let us now visit the individual books so that the reader can himself have an idea of the syllabi to know as to what is the orientation of their school going child. Social Studies is he subject which comprises of History geography, civics economics etc class X book is written by Mrs. Uma Bhanot, Dr. Manju Sharma, lmproved by; Dr. J.K. Sharma, Translator, Smt. Amarjit Kaur, & Smt. Surinder Kaur . Subject Specialist: Smt. Rupa Sareen (History Part) Subject matter in the history part is: Capitalism, World war-1, Russian Revolution, World war-ll, Freedom Struggle. The book devotes 1 .5 page on Arya Samaj, Singh Sabha Lahar-1.5 Page, Namdhari movement-1 .5 page, Gurudwara Reform rnovement-1 page, Jallianwala Bagh- 1 page. We all know the monumental contribution of Akalis in the freedom struggle. The whole of Punjab was to go to Pakistan but for the agitation launched by the Akalis. A large part of Punjab namely' present Punjab, Himachal, Haryana were saved for India. There is no mention of the names of Master Tara Singh, Baba Kharag Singh, Giani Kartar Singh etc. whose role had been even lauded by Mahatma Gandhi himself on certain occasions. THE AKALIS ARE AS SUCH ABSOLUTELY BARRED. The Board can teach about Russian Revolution but not about the Sikh religion which was born here. lt considers knowledge about capitalism more appropriate. lt gives details about the freedom struggle but fails to highlight the sacrifice of about 10 lac Punjabis who were massacred during the Partition of the country. ln the civics part there are essays on state legislature but makes no special mention of the legislature in the Punjab. lt appears as if the book has ben written for the students outside Punjab. ln the geography Part inclusion of geography of Punjab was appropriate but has been ignored. Pre-history, lron age, Early American and African Civilization, medieval world, origin of modern age, capitalism and Industrial revolution and national movement Again the book mentions everything as above but little about Punjab though the history part is h 129 pages. The author here face an uphill task as they are compelled to write something about Sikhism as they are supposed to cover Medieval Period. They finish it in just one page giving the peripheral information about the faith. The book in Punjabi is too much loaded with Sanskrit words which were avoidable. ln the civics part the authors have confused students with their chapter on concept of nation. lt fails to mention how lnda is a nation. lt blames British Imperialism for the lack of spiritof nationalism in Indians where as the facts are on the contrary as it was the British rule which made the present India otherwise' it was divided into several (564) princely states but the British unified India. The syllabus is British Empire, Mutiny of 1857, Nationalism and freedom struggle & Freedam. Mark the text book prescribed for Ptniabi students couers the annexation of Punjab in just one page. lt however does not fail to remark that the Punjab princes participated ' in crushing the 1857 uprising. Authors are particularly opposed to the British policy in recruitment for army and object disproportionate recruitment of Sikhs Gurktas and Pathans. As for as the Sikh in freedom struggle is concerned the authors do mention the Punjabis but they do not move beyond Gadharites Again there is no mention of the Akalis. ln the civics part here a chapter on the consumption narcotics and drugs that was deserved but has not been given. Syllabus North & South Indian states (800-1200 AD.) and (1200-1556) Medieval powers Mughal Empire (1556-1765) Religion, Advent of Europeans. So this is the section covering Medieval period with Guru Nanak is covered with a galaxy of saints like Kabir Sahib, Bhagat Ravidas, Chetanya Mahaprabhu, Sufi Sect, Ranjit Singh's rule and Misal period. The space given to Punjab in this book is perhaps less than what the UPSEB Lucknow has given or any other state would wish to educate to their students on Sikhs. The geography part also does not deal with Punjab in any way here. Out of 156 pages of history only 18 have been devoted to Sikh history. The book is too much loaded with Hindi words rather it is mixture of Hindi & Punjabi written in Gurmukhi script. The write rof the History part Dr. Indu Banga seems to have a fairly good hold over the subject though she has treated it as if she was writing for students out side Punjab. She has treated Sikhism as an off shoot of Bhakti Movement and that Guru Nanak and Kabir had identical ideology. Syllabus : Pre-history Indus ValleY Civilization, Vedic period, India (600 BC to 8OO A.D.), India & World. Again no mention of he Punjab rulers especially Shahia nd Porus of Alexander. Civics part devoted to local bodies and only a general topic; no special reference to Punjab bodies. I .Sanchi Satupa, 2.Allahabad Pillar, 3.Madurai Temple, 4.Quttub Minar, 5.Pillar at Chittor, 6. Agra Fort, 7.Red Fort Delhi, 8.Pune (Poona) and 9. Jallianwala Bagh. The list includes all the historical monuments outside Punjab. From Punjab only one monuments is covered i.e. Jallianwala Bagh which was erected in the 19 fifties again in connection with the incidence of the year 1919. The editors of the book could not find any old monument frorn Punjab which might have been fit for the category. ln the civics part there is an article 'Development of Agriculture in India-Yes development of agriculture in India and no mention of role of Punjab-because it is from PSEB. Again there is a chapter India attains freedom and is Partitioned. No reference no tribute to about 10 lac people who laid down their lives during Partition. PSEB believes that they have systematically planned the whole curriculum and with the development of mind of the child the subject is also developed progressively. But at the same time a chapter or a subject taught in a class is not to be repeated afterwards. Like the students of 1st and llnd standards is to be taught about his home, village, school & city etc. 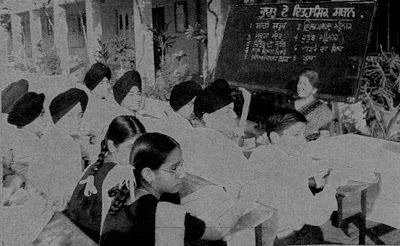 while the 2nd class pupil will learn about his district, lV-Punjab and V-lndia, and so on. ln the whole curriculum but together there is too much of repetition of information on Freedom Struggle. Forth standard is scheduled for regional history and the Board finishes Punjab history in just 8 pages. Rest of the book on history contains chapters on the historical spots. ln the geography part the book contain some of the outdated information on industries, business, chief cities, agriculture etc. lt has the Punjab's climate, land,' vegetation, means of transportation, people. And that is all for Punjab-in just 124 pages. Here the Social studies book is focused on the district. The book we have referred to is on district Amritsar. By now it should not surprise the readers that the book focused on Amritsar hesitates to mention anything about the historical importance of Amritsar. lt fails to highlight the unique position that Amritsar occupies in the world. The Board has no printed guidelines for the teachers neither any text book for the students. The Board expects that the teacher will do it all. As a matter of fact no school, is giving any lectures on the S.Studies in these beginning classes. Apart from Social Studies text book survey of Punjabi language, books published by Punjab School Education Board was carried out. lnterestingly again the Board had appointed only such members on the text book panels who are known agnostics and have no concern (emotional) for the Punjab. lnterestingly there are some dubious writers whose articles have been included in the text books. There are some biographies in the text books devoted to virtually unacknowledged or unknown artists. Then there are articles by these artists. Whole syllabi of 8 years has ignored the Akalis in Freedom Struggle. your child has no access to the names such as Master Tara Singh, Baba Kharag Singh, Kairon. S.S. Majithia etc. The panel has however included one biographical chapter on Sewa Singh. Coming to the part on the chapters on religious studies and religious personalities, we see chapters on Bebe Nanaki, Krishan Sudama, Fetehgarh Sahib, Guru Nanak, Mata Gujri, Bachittar Singh, Bibi Bhani, Vaisakhi, Baba Jiwan Singh, Sant Kabir, Amar Nath Yatra, Baba Farid, Guru Amardas, Guru Gobind Singh, Very selective information again and far from being objective. Board's introductim about Sikh religion begins from ll class when its ll part pustak devotes on chapter on Bebe Nanki straightaway. lt narrates the Sacha Sauda story which suits the Marxist ideologue. No formal introduction of the Nanak's faith is given. ln the lll Std. a chapter on Guru Nanak given where again no reference that he was founder of the faith, and that he gave a new concept of unity of God and attacked the evils such as casteism prevalent in the society and that his was a was simple religion free from all rituals. His concept of Ek Onkar Satnam is again missing. Like a chapter on Bebe Nanaki, there is one on Mata Gujri and Bibi Bhani. There are casual reverences to Guru Gobind Singh's younger sons aged less than 7and 9 years respectively who laid down their lives Upholding the religious ethoes and values. ln the chapter on Bibi Bhani name of Mohan-her brother is given as Sohan Singh. A chapter on Baba Jiwan.Singhguru ka beta does not mention that he belonged to the so called low caste and the status conferred on him notwithstanding. Similarly therei s a chapter on Bhai Kanaiya without a mention ' of the basic concept oJ Sikhism to which Bhai was complying. Virtually no aspect of Hinduism is given in these 8 years except one poem on Krishanudama and Amarnath yatra which is more of a travelogue. There is one chapter on Guru Gobind Singh -Machhiwara episode; in way the Guru is depicted as the one devoted to the patriotism of Bharat mata wtrere as the Guru cannot be confined to the national boundaries. For ninth and Tenth standards there are common four books from the Boards. Sahitmala gives the History 'of Puniabi Literature, (poetry and Rose). and one feels that the editor has done justice though the editor has specifically selected such pieces from Gurbani which do not touch the basic tenets of Sikhism and nor it is different from others. The plea of the edito could be that he has selected the pieces from literary aspect only cannot hold much ground as most of the Gurbani with basic tenets extremely rich from the literature point view as well. ln the prose part Muslim writer of Punjab have not been included. A novel by late Sohan Singh Seetal perhaps rightly deserves the place in syllabus. The Matriculation book on grammer and composition carries essay writing Letter writing etc. and markt he subject; Guru Nanak, Tagore, Maulana Azad, Kartar Singh Sarabha, Nanak Singh Novelist, Diwali, Our Festivals, 26 January Humility, Habits die Hard, Fair I have Seen, Man & Science, Jugglers play, A Tour to a Historical place-Taj Mahal, Unemployment problem, population Problem and a Newspaper. Essay on Guru Nanak is by some Marxist. About Guru Nanak the writer says 'His cheif @noem was common man and his welfare'.Whereas we know that that Guru was mainly concerned with the , salvation of makind through linking it to God Waheguru that is Ek-onkar. The writer tells the Guru during his journeys would stay with the labourers'. We next come to he other text book on Punjabi; Vanngi the drama and short story book. lt contains in all 19 stories and plays of various writers. Of the writers patronised 9 arc proclaimed Marxists namely Sant Singh Sekhon, Gursharan Singh, Sujan.Singh, Santokh Singh Dhir, Gurdail Singh, Besides these Maxists writers the editors have preferred other writers such as Balwant Gargi, Jasuja, Duggal KS Virk, Tiwana, & Ajit Kour who are committed to socialism through progressive thinking. Thus for the editors any talk of theology is out of bounds and out dated.
' 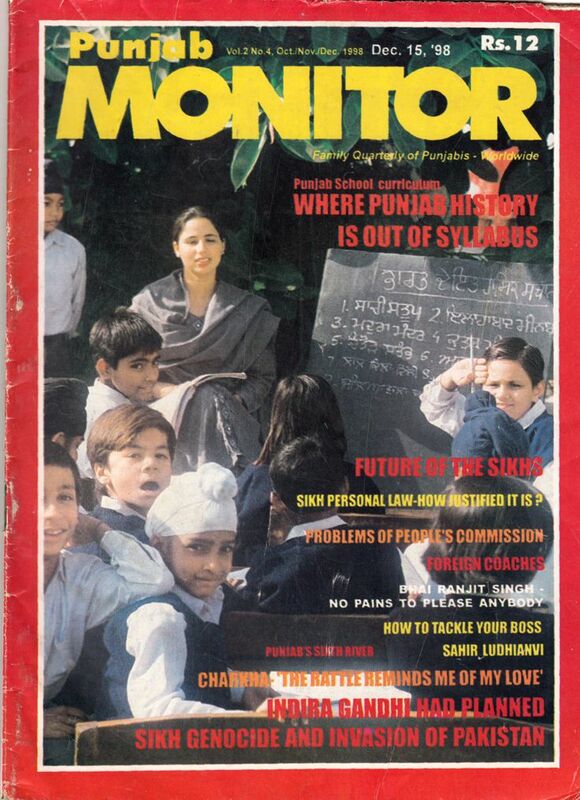 The position of Punjabi in schools is miserable. Punjabi has failed to enjoy the status of a regional language like other Indian languages which they enjoy in their respective states. A large number of private ,schools in the state are imparting education Hindi & English. The DAV schools as a rule have not adodpted the Punjabi as the medium of instruction and are at the same time enjoying government aid as well since 1966 i.e the carving of Puniabi speaking state.The' Govenrnent is thus promoting Hindi medium itself and befooling people with loud slogans. During our survey we found some of the books are in Hindi but translated in Punjabi . You can understand how the beauty of original language writing is lost in translation. We thus felt as if we were reading Hindi in gurmukhi script. Example Social Studies class VII book.